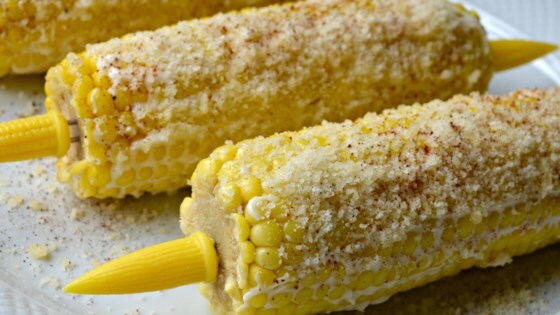 "On the streets of Santa Maria, California, street vendors (think an ice cream man with a 'trash can' full of hot corn on the cob instead of ice cream) roam the sidewalks selling corn on the cob for a dollar an ear! They slide a wooden skewer in one end for you to hold the corn. We crave it often and it's become a regular on our Saturday grill nights! Give it a try. You'll be surprised!" Bring a large pot of water to a boil and gently place ears of corn into the boiling water. Reduce heat to low and simmer until corn is very tender, 20 to 25 minutes. Remove an ear of corn with tongs and spread about 1 tablespoon of mayonnaise all over the kernels. Squeeze about 1 tablespoon of margarine over the ear of corn in a zig-zag line, turning the ear as you squeeze. Generously sprinkle Parmesan cheese over the ear and dust with chili powder. Repeat with remaining ears of corn. For a less adventurous taste, pour lime juice in plate, roll corn in lime juice, and sprinkle with salt and chili powder to taste. Either way is incredible and until recently I ate it with just the lime juice, chili powder, and salt since I don't care for mayo. Boy, was I missing out! Traditionally they have bottles of concentrated lime juice they add a spray bottle top to, and spritz the corn instead of rolling it in the juice. I don't go through lime juice to buy it by the bottle, so I stick to the fresh lime.